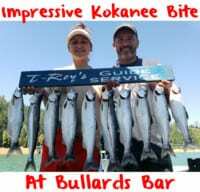 There’s many hot kokanee bites in Washington. 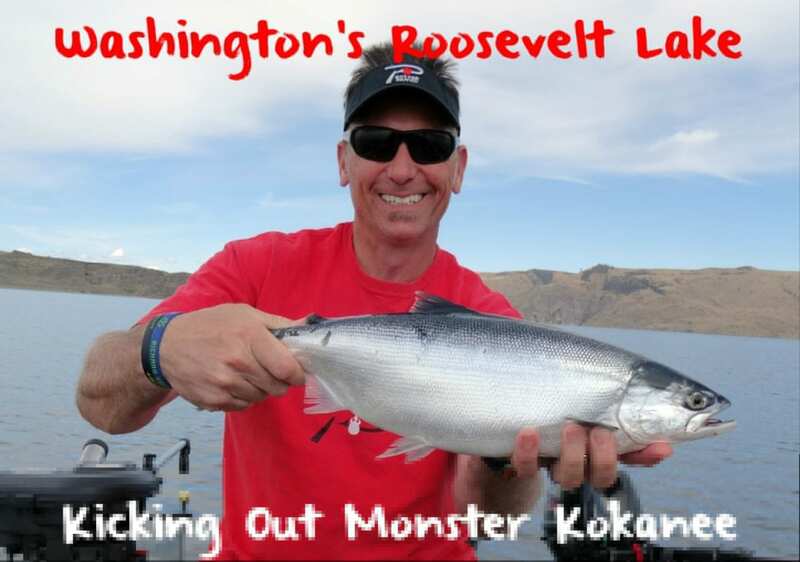 However, no reservoir can rival the size and quality of kokes being caught in Lake Roosevelt. 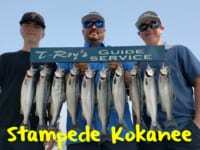 It’s become the go-to place in the Northwest for trophy kokanee. Normally, anglers target them in the winter, but spring and summer can be productive, too. And, it is right now. On the other hand, 150-mile long Roosevelt Lake isn’t an easy place to get to from our major metropolitan areas. Between Grand Coulee Dam and the Canadian border, Lake Roosevelt National Recreation Area is roughly five hours from Seattle. It’s a dammed portion of the Columbia River. It’s the largest reservoir (or lake) in the state and home to monster kokanee. I spoke with Chris Donley, the Region One Fish Program Manager for the Washington Department of Fish & Wildlife and he confirmed mild temperatures and an abundant food source has equated to a high survival rate for this year’s fish. While these large kokanee have always been here there’s more than average this year. I recently fished the reservoir for a few days and was met with a lot of wind. It can get breezy at times no matter where you fish on the Columbia River corridor, but the front that greeted us unfortunately drove us off the lake the first morning. Fortunately, we fished long enough to net a couple fish that I would call world class (those in the three- and-four-pound class). The majority of kokanee congregate above the dam in about a four-to-five-mile stretch. We launched at Spring Canyon Campground and motored up lake about two miles and focused on trolling in 200 feet of water. Set your sonar gain to around 80% to identify fish and the zoom to around 90 feet. It’s important to know how deep it is, but focus on the top 80-100 feet so you can truly see what is beneath you. We caught most fish between 46-50 feet and trolling 1 to 1.4 mph. I trolled a gold Arrow-Flash dodger (that I add moon-jelly tape to) and paired it with an LP shrimp/rasticle. 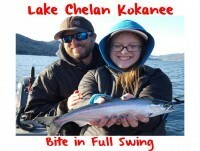 Regardless of what kokanee lure you use it’s important is focus on small presentations, beaded lures and orange or pink small blades. I tipped all hooks with Natural and Pink Pautzke Fire Corn. 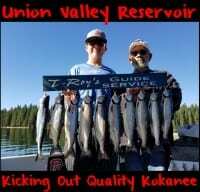 Kokanee are scent junkies. In my opinion it’s imperative to scent the Fire Corn, which is easy and lasts all summer if kept in the refrigerator. I like Fire Corn because it’s a shoepeg corn that’s been cooked. Cooking it makes it tough and durable and enables the bait to stay on the hook even after it gets bit. It gives me confidence to know that it is still there and will continue to fish. To add scent I keep it simple. There are so many scents manufactured today that you need to use what you have confidence in. The scent combinations that I rely on are krill/anise, shrimp/anise, tuna/garlic, herring and squid/anise. To add the scent to corn I open the jar and remove a small amount of the corn to make room for the oil l add. Don’t throw the extra corn away. Put it in another container and as you collect corn from several jars you will have a jar with mixed colors. You can also add scent to this jar. Decide which corn color you want to add scent to. Then squeeze in your oil of choice. Here I’m adding Liquid Krill. I want to have a krill/anise combo. Before I add the Liquid Krill I add the anise to the bottle of krill; 100% pure anise is so strong I want to blend it with the krill before adding it to the corn. I add six-to-eight drops and then add it to the corn. I can do the same with shrimp/anise. Here I am using a different anise oil that is thicker than 100% pure oil. I can add the shrimp oil and then the anise oil. Mix and match the scents you’re confident in. I usually put two pieces of corn on the top hook next to the lure. Then I will place a different color of corn with different scent on the bottom hook. Kokanee are attracted to color-contrast and multiple scents. Editor’s Note: Big Duane Inglin is the host of Seattle’s Northwest Wild Country Radio. He’s become a kokanee fanatic the past few years. To learn more about his show please visit https://www.facebook.com/Northwest-Wild-Country-177883655555995/?fref=ts&em=1.